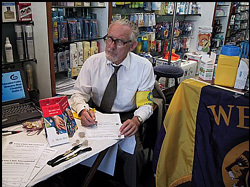 A group of Lions Club volunteers assisted by two qualified nurses carried out a diabetes screening at two of the local chemists in Malahide. Over two days 67 people were screened with the following results: Normal 60 and possible 7. The club has been operating this programme annually since 2010. The results are the most positive since the exercise commenced, with just less that 10% possible. This contrasts to just over 20% when the programme started. This is an ongoing service provide by Malahide Lions Club to their local community, in keeping with their motto "WE SERVE". From time to time, Malahide Lions organise a series of screening sessions for Diabetes, a potentially debilitating illness if left undetected. The Lions act as facilitators only. The testing is conducted by qualified nursing or medical personnel who carry out a simple blood test (involving a needle prick to the finger). In cases where a certain level of blood sugar is recorded, the participants will be referred to his/her own doctor. The Club continued the programme through 2014. We have the enthusiastic support of local nurses, Medical Hall, Mc Cabes Pharmacy and a committed team of Lions. We have been successful in identifying people who needed to be referred for medical treatment and these people have been most appreciative of the service being provided. 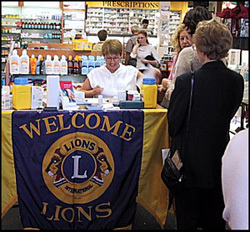 As part of Malahide Lions Club community support projects, screenings have been organised on a continuing basis with the assistance of a local doctor and support from the local pharmacies. The results from 2010 and 2011 show that, out of 238 screenings, over 20% have been categorised as being either possible or definite cases of Diabetes. The individuals concerned have been advised to contact their own doctor for follow up procedures. This is a valuable service to the community and is carried out free of charge in a fully confidential manner. Why is it important to know how diabetes affects the eyes? If you have diabetes - or if someone close to you has this disease - you should know that diabetes could affect the eyes and cause visual impairment. Fortunately, there are ways to prevent or lessen damage to the eyes caused by diabetes. That is why it is so important for people with this disease to have a professional eye examination as soon as their diabetes is diagnosed, and at least once a year thereafter. Annual eye examinations are especially important for people who stand a high risk of developing eye complications from diabetes. These include persons with diabetes who have had their disease 5 years or longer, and those who have difficulty controlling glucose levels in the blood. It is estimated that more than 200 million people are now afflicted with diabetes, at risk of losing sight due to a serious complication of diabetes - diabetes retinopathy. Diabetic retinopathy affects the retina - the light-sensitive tissue at the back of the eye that transmits visual messages, via the optic nerve, to the brain. When this delicate tissue is damaged by diabetic retinopathy, the result may be visual impairment or blindness. Diabetes awareness was adopted as a long-term commitment of the association in March 1984. The primary objective of the Lions program is to reduce the number of new cases of blindness caused by diabetic retinopathy through diabetes education, early detection and treatment, and support of research.